"My life didn't magically turn perfect after that. I didn't 'get the guy,' as they say.... Instead, I threw my passion into things I enjoyed, rather than feeling sorry for myself. I realized that I had been letting the way I looked on the outside affect how I felt on the inside. But the more I focused on my interests, the more it brought out things I liked about myself. And that affected the way other people saw me!" 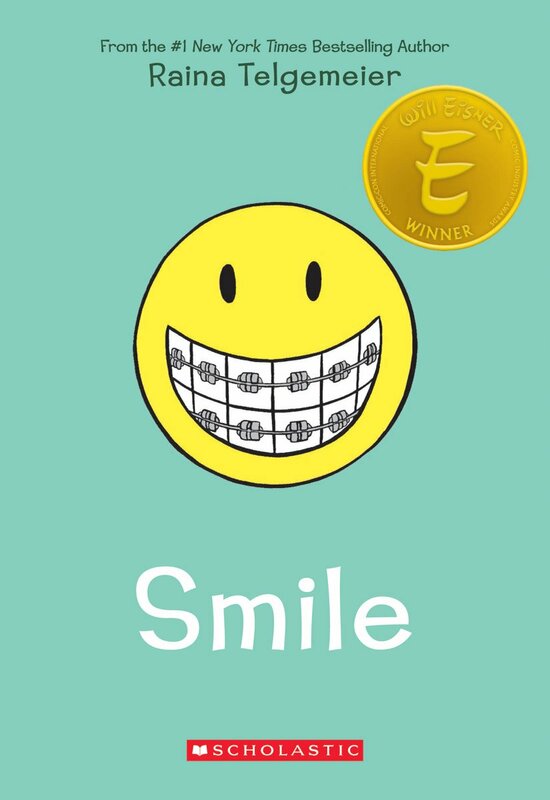 This graphic novel memoir details Raina Telgemeier's adolescence and her struggles growing up amid the tragi-comic narrative of her ever-changing smile. I thoroughly enjoyed reading this book. While it's designed for a young adult audience, the book is one that can easily be loved by both child and adult audiences--particularly by anyone who's ever spent more than one miserable hour or two in a dentist's chair or who grew up in the 1980s and 1990s and remembers headgear. Raina's struggles with her smile begin much like so many other teenagers' experiences: at age twelve she learns she needs braces. What follows, however, takes her experience from the ordinary to the extraordinary. Just a few days after hearing the news, Raina trips while running to keep up with a friend. When her face hits the pavement, she loses her two front teeth as one falls out and the other gets shoved straight up into the roof of her mouth. Thus begin years of painful surgeries and doctors' visits that plague her teenage years. 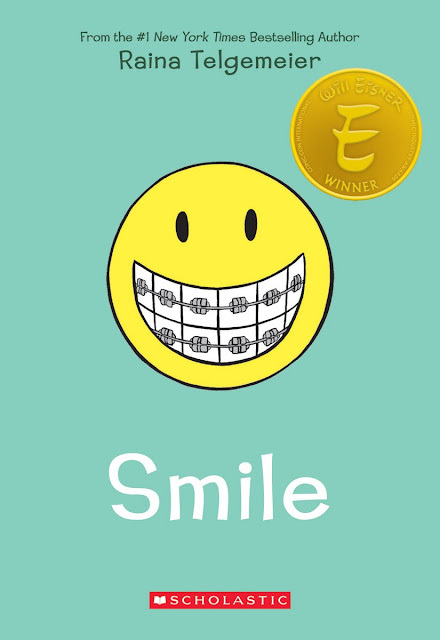 More than just a diary of dental visits, Smile is a funny and relatable story of the growing pains of being a teenager. Raina struggles with friends, boys, school, her appearance, her health, and finding a place where she belongs. I really liked Telgemeier's bright colored illustrations and her artistic style. The way she depicts her childhood growing up in the 80s and 90s is a great snapshot of memory lane. The book was a quick read and totally enjoyable.